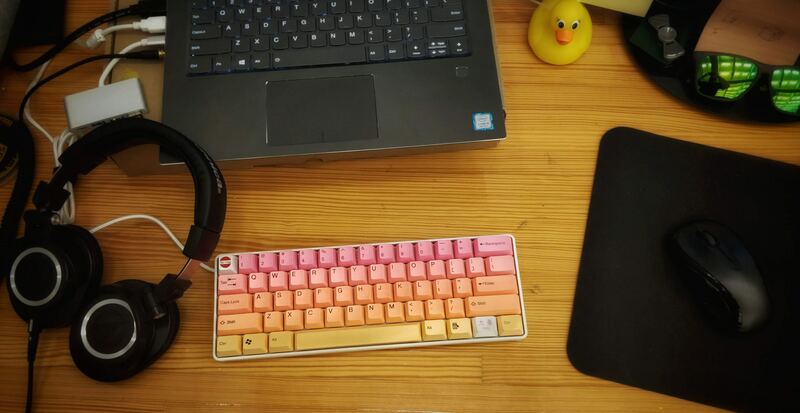 Not techy? Not a problem! Are your digital skills are a bit rusty? Or maybe you've been out of the workplace a while and don't feel comfortable with the tech tools used by remote teams? Never fear, our Tech Tools And Digital Skills Mini Guide is here! Remote employers won’t expect you to be an expert in lots of online tools, so don’t feel you need to spend hours becoming a Slack or Trello ninja. But getting familiar with a few key tools might be helpful, particularly if you’re interviewing with a company where most people work remotely. Our Mini Guide covers the basics, and there’s no geeky jargon (we promise). This article focuses on some of the tools that are commonly used in remote teams – and, increasingly, loads of other workplaces too. There are plenty more tools out there, so do explore! At the time of writing, all the tools mentioned below are either free to use, or have a free trial option. If you are using a laptop or PC, you will need a webcam if you want to try video conferencing; if you prefer, most activities can also be done with a smart phone or tablet. If you install any apps or software, please do remember to always back up the device you are using beforehand, just in case. These tools typically bring together simple task management functions (such as lists and calendars), plus file sharing, and real-time communication tools that let you type comments to team members (a bit like Facebook). The idea is to replace endless emails, in-person meetings and awkward sharing of documents across several different systems, by bringing most things your team needs day-to-day into one streamlined, online world. The tools are intended to be intuitive to pick up and fairly informal (even fun) to use. Check out these video guides from Slack, Asana and Basecamp if you’d like to see examples of these tools in action. If you want to explore in more depth, all three offer a basic, free version that lets you look around. Try using Slack in our free online group! If you’d like to really get some practice in, come and join the free Virtual Coworking group run by myworkhive! It’s a free group for job hunters, freelancers, remote workers and digital nomads – basically, anyone working solo, mainly from home/remotely. We use Slack to chat, share ideas, network, let each other know about events or jobs – and more. It’s really friendly, and Lucy (who runs myworkhive) is usually around to say hi! There’s more info and a free signup here. You really don’t need to become an expert in all the (many) virtual office tools out there – but it’s worth having at least a quick look at one or two as you start your remote job search, particularly if you’re mainly looking for roles in fully remote companies. When you’re interviewing with a remote employer, you might want to ask what tools they use to help keep their remote teams on the same page. We know, we know…video conferencing can feel really awkward at first. It does definitely take a bit of getting used to. But lots of remote employers use video tools for meetings. And some interview candidates via video, too, so it’s probably worth putting in a bit of practice if you’re not that comfortable in front of a camera. We’re going to take a quick look at two of the big-name free video conferencing tools, Skype and Google Hangouts. There are loads more including appear.in and Zoom. 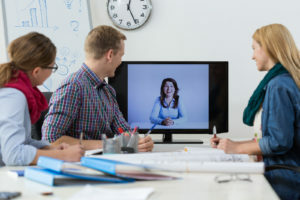 You might also encounter some of the more expensive business video-conferencing options such as Blue Jeans and Go To Meeting, particularly if you’re interviewing with a big company running a very large distributed team. Before you start: You’ll need a webcam for video conferencing on a PC (many laptops already have a webcam built in.) And please do always back up the device you’re using before installing any new apps, software or plugins, just in case. Skype lets you connect in real time with other Skype users, via written messages and free voice or video calls, straight from your laptop, PC or other device. (You can make phone calls to non-Skype phone numbers, but you may be charged for this.) You need to install Skype on your chosen device, create an account, then add some contacts. You can install Skype here (please back up your device first!). Find and add your contacts. You can search for people you know, but many people choose a username rather than their real name, which can make it tricky to find them – you might need to ask people for their Skype name. Get started! A contact is online if they have a green dot besides their name. Click on a contact, then either start typing, or press the film camera icon for a video call or the phone icon for a voice call. You can add more people to a call with the plus icon. You’ll need a (free) Gmail account or Google account to use Google Hangouts. (You can join a Hangout call without this, but to set up a call, you do need a Gmail account.) If you don’t have one already, you can set one up here. 2. Next, go to the main Hangouts page at: https://hangouts.google.com/ or here. You’ll need to download the version of Hangouts that you’ll be using (they have options for Android and Apple for smartphones, and Chrome for PCs.) Remember to back up your device before downloading anything! 3. Have a look through these resources to give you an idea of how it works: Google’s own ‘how to’ page is here. Zapier has a great, detailed tutorial which walks you through signing up and getting started (it’s from 2014, so some features may look a little different, but it gives a good idea of how Hangouts works.). Once you’re all set up on Hangouts or Skype, you could ask a friend or family member if you can set up a practice video chat for later in the week. (Remember – all these tools are currently free to use, so neither of you should have to spend any money.) Lots of remote employers do job interviews via video, so it’s a great idea to practice before you have any interviews lined up. If you’ve got time, we’ve selected a few tutorial videos for you to see Google Hangouts and Skype in action. Two popular options here are Google Drive (and Google Docs) and Dropbox. Both let you create documents, share them in the cloud, and collaborate with others. Sharing documents this way helps with collaboration – you can leave notes and comments for colleagues, and everyone can see the current version. The terms Google Drive and Google Docs often get used interchangeably. Google Drive allows you to store and share a variety of things (such as documents and photos) online, ie in the cloud; Google Docs is the actual thing you create documents in (equivalent to Word on a PC). You can also create spreadsheets, forms, maps etc. To get started, you’ll need to create a (free) Google account or sign up for Gmail, then you can just log in and open up Google Docs. There are detailed guides at Google Support, or take a look at the video guide, below. Dropbox is another cloud-based service that lets you save and share documents, videos, photos etc. Again, it’s free to sign up and create a basic account. Really getting used to the various tools – including how to collaborate, change privacy settings and so on – can take a while, so don’t feel you need to learn everything all at once, or become and expert in both Drive and Dropbox. Just start by picking one and having a bit of a play around – perhaps using the tools to create and store the documents you need for one small, personal project. There are a number of stand-alone tools for managing tasks and to-do lists, such as Trello, To Doist, Workflowy, Toodle-Do and Wunderlist. Trello is a favourite at myworkhive, so we’ll take a quick look at that. At first sight, Trello looks very simple – you create boards (like a virtual pin board), to which you add lists, and then just add little ‘cards’ to your lists. You can add text, website links, images and more to your cards. You can easily move cards between lists, or delete them when you’re done. Sign up for Trello (it’s free.) Just remember to back up your device before installing anything new. Go to Create New Board to set up a board for your project. Inside your new board, click ‘Add a list’ to set up your new lists (click at the top of a list if you want to change its name). List names can be anything you like – some people like to use three simple lists for To Do, Doing and Done items, while large projects might have many boards and lists. With your lists set up, you’re ready to start adding cards. Just click the ‘add card’ text at the bottom. Once you’ve opened a card, trying adding images, checklists and web links. You can also easily move cards between lists – just drag them to where you want them. Remember the video chat you planned earlier? It’s time! Make a coffee, get comfy, turn on Skype, Google Hangouts or whatever you are using, and get started. Don’t worry if you lose the connection – just restart if you need to and carry on. Can your friend clearly see and hear you? Is it light enough? Placing a desk light or floor lamp so it shines on a wall nearby (not directly on your face) can help a lot. Do you have a clutter-free, professional looking background? It’s best to avoid having personal items such as family photos behind you. You’ve done it! If you’ve worked our way through our Mini Guide, by now you will have created documents online, had a video call, found your way around some virtual office software, and used a task list. These are pretty much all the main tool types you’ll be likely to encounter if you join a remote team. If you have time, you could try out some more tools, or get more experience using the ones you’ve set up. CV Tip – Why not add something to you CV or LinkedIn page, to let employers know that you’re familar with key remote tools, including video conferencing. If you’d like to know more, YouTube has many great, free video guides and tutorials – but nothing really beats putting the tools to use yourself. We hope this Mini Guide has helped you feel more confident with some key digital skills and tech tools for working remotely. Comments? Suggestions? Please do get in touch, or follow us on social media to join the conversation.